From London to get up to Liverpool, we took the National Express bus, which was much like a small airplane. There were paying passengers cramped into a small confined vessel for hours at a time and a stewardess. The stewardess would make her way through the aisles and offer everyone soft drinks and tea. I had never been on a bus before, I don’t imagine they do this on Greyhound, but maybe I’m wrong. I got a kick out of the parallel at least. Blondie didn’t seem to notice or care. Half way to Liverpool we stopped on the side of the road in the middle of the countryside to have a smoke break. I didn’t smoke, but I went out to take some pictures and stretch my legs. While I was out with the smokers, I met an angry couple. They were on their way back home from London; they had to go down there to collect their prize. 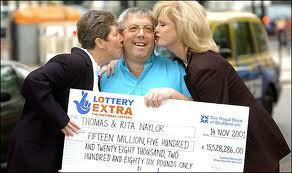 Turns out the couple had won 30,000 pounds in the national lottery; they hit five out of six numbers. They played every week and always used the same numbers: 3, 14, 6, 22, 12, and 31. They used those number because he was born on December 31st, she on June 22nd, and they got married on March 14th. If they had married on the 15th, they would have won eight million pounds. The winning numbers were 3, 15, 6, 22, 12, and 31, they missed only one number and they missed it by one. He had wanted to marry on the 15th, but she was afraid to get married on the Ides of March. There was a fight before the wedding about the date, but he eventually caved in. She thought that was settled and would never be brought up again, but ten minutes after the numbers came in, it was again an issue. For ten minutes they were the happiest couple. They were screaming, hugging, laughing, planning purchases, and generally loving life and their good fortune. The man remarked how they were so close to the big jackpot.